From first purees and delicious snacks to tempt toddlers with tiny appetites to imaginative and nutritious meals that the whole family can enjoy. 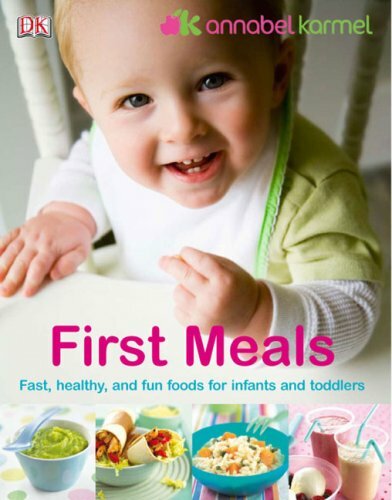 First Meals includes more than 150 fully illustrated recipes, all of which have been tested on a panel of babies, toddlers, and young children. There's a popular game at baby showers in which the new mom-to-be has to taste jarred baby food and guess its contents. Inevitably, the first comment is "Yuk! How do they eat this stuff?" The answer, of course, is that babies don't know there's an alternative--fresh, delicious, wholesome food made at home. In the beautifully and extensively illustrated First Meals, Annabel Karmel explains how simple and satisfying it is to make baby's food yourself--from the earliest mashed banana and steamed carrot purees to Singapore Noodles for 3- to 5-year-olds. Karmel begins with an extensive section on early nutrition, pointing out that while grownups are often encouraged to follow a high-fiber, low-fat diet, "the under 5s need significantly more fat and concentrated sources of calories and nutrients to fuel their rapid growth during the early years." Continuing her "Basics" chapter are sections on keeping a well-stocked pantry; the equipment you'll need; illustrated, step-by-step instructions on preparing your first purees; and notes on freezing and reheating food. Close-up views of spoonfuls of puree are especially helpful for nervous first-time chefs. Chapters of recipes and feeding information are then broken down by age--4-6 months, 6-9 months, 9-12 months, 12-18 months, 18 months-2 years, 2-3 years, and 3-5 years, with each chapter addressing the particularities of the given age (questions about starting solids are answered for parents of 4-6-month-olds, while maintaining a healthy and varied diet and packing lunches are the concerns for the preschool child), along with 20 or more recipes appropriate to the child's level. I really like this book. It has great suggestions and pictures. Love pictures. I like that it has a great variety and also tells of cooking times, etc. for the various foods. A must buy for the mom who is making her own baby food. I love this book. I was irritated about the poor reviews that said this book "lacks substance" or complaints that the recipes aren't realistic, or whatever their issues are. They obviously didn't read the same book or are too lazy to make the recipes. Since that's the case: There's always jarred baby food. The point of this book is for parents who want to make their baby's first foods so they have more nutritional and healthful values rather than opting for the harmful additives in jarred baby foods. Yes, it will take more time to make the foods but it's worth it for the health of your baby. I was pleasantly surprised with this book. Not only does it cover baby's first foods but goes up to age 7 with tasty recipes that the whole family can enjoy together. It even shows colorful pictures of completed food dishes with smiley faces and edible hair (angel hair pasta) to make the food more enticing for your little one (since they tend to be picky sometimes). The book even goes above and beyond by sharing extra details about exactly when to start feeding your baby solids and what solids to start with (and which to avoid). It even tells you why your baby should only drink boiled tap water and to never give your child bottled water because of the high levels of sodium. Fantastic source of recipes for your kids! This is the best kids recipe book I've used! There are so many things I like about this book. For one, the limited use of salt. The author provides recipes that are very mild and perfect for picky eaters. Plus, I get to eat some of the food and not worry about lots of salt. I also like the way she breaks down the age groups and provides recipes according to your child's age. I did find it easy to reference past recipes for my older toddler, and she still loved the food. There are some people that complain about the difficulty level of the recipes. They fail to mention that once you spend a couple of hours preparing food for your child, you can freeze most of it and heat it up during the week. The author does a great job of telling the reader which recipes can be frozen and which cannot. That makes meal planning so much easier for me. The author also gives you the nutrients in each recipe. Perfect for moms like me who want to watch what their kids are eating. Pros: Great photos. Great descriptions of what tools you need. Good serving and storage suggestions. For younger babies, she gives a great variety/mix of foods. I like how it was written out in sections. I haven't read this particular book, but I have a similar one by the same author purchased in the UK. The author is British and guidelines as to when to introduce foods vary from those set here in the USA. This may help to explain why Annabel's advice differs from professionals' here. I usually live in the UK and some of her advice is in conflict with the health visitors' amd doctors there as well. Anyone who has many children know that they change these guidelines quite regularly. Even a couple of years ago, they told us to feed babies cereal from 4 months old, now it is 6 months. They used to say not to give kids cheese until 8 years old. My doctor told me to feed my 8 month old son at 5 months because he was really, really ready. I didn't feed him nuts, dairy, soy, etc. Just rice! Speaking of which these recipes call for some milk, but it is cooked. I am sure most of you are using formula made of dairy(I am still breastfeeding), so I am not sure what the problem is with that?? I bought this book for my daughter when she was pregnant. She had been thinking of getting a different book, but decided this one was probably even better. She used it extensively when my granddaughter was first beginning to try solid foods, and continued to use it through about 9 months. At that point, the baby was eating nearly everything her parents ate, and there was no need to tempt her into eating vegetables. I also used the book to make baby food when I was visiting my daughter. I made things in large quantities and froze small portions in ice cube trays. The next day, I would put the "cubes" in a plastic freezer bag and start over with a different food. That way my daughter had plenty of meals ready to use when I went home. I didn't find the recipes too complicated or lengthy. Sometimes I modified ingredients or simplified a procedure. You don't really need a book to cook carrots in the microwave; this book combines ingredients to make tasty and healthy meals. The results were good enough to eat up myself if the baby turned up her nose at them. This book flies in the face of most of the literature I've read about when to introduce foods to new eaters. It also is unrealistic, in my opinion. Not many moms will have time to cook like this for their baby. Maybe check it out from a library or flip through it on a store shelf before you decide to purchase, to see if it's right for you. EXCELLENT book - easy, tasty, nutritious! This is a great book - I have used it for 4 months now and have recommended it highly to many others. Takes the fear out of making your own baby food! Delicious, nutritious food - and with "normal" ingredients. Several other books that I looked at had strange ingredients that my husband and I would never eat (ie: seaweed??) - with this book, we actually finish her food if she doesn't eat it all! I appreciate the mixture of recipes to make as well as simple 1-2 ingredient no-cook and quick-cook purees. She has close-up photos to show you texture (which I definitely needed early on), as well as suggestions on how to cook, puree, and freeze basic fruits and vegetables. The book is MUCH better organized than others I looked at, which makes it much easier and enjoyable to use. Great cook book for baby foods! Now with my second child I've ventured for some of the more exciting and more rewarding recipes. Last night I made half of the recipe for chicken snails. Okay, so I didn't finish the recipe to make the snail but the homemade chicken sausages were just soo awesome and tasty that no one cared. It took an hour for my 2.5 year old toddler (with an 8-month old clamouring for attention) and I to make the sausages. The effort was so worth it as both of us were so proud to make homemade tasty sausages! I used this book for both of my older children (now 7 & 4) and just dug it back out for our new little one (7 months old). Once again I am impressed by the variety of recipes presented. I think offering a wide variety of healthy foods from the start of solid feeding is one of the reasons I don't have any trouble introducing new foods to my older children now. They love their vegitables and enjoy trying all types of food even those that many adults would find new or exotic. I agree that some of the recipes take a bit longer than opening a jar and reheating. Many take the same amount of time as preparing a dish for an adult dinner...but since many of the recipies can be frozen (I make bigger batches and then freeze in small portions that can be thawed as needed) I only need set aside a couple of hours every month or so to have a wide variety of good and healthy dishes available to serve. My older kids still enjoy some of the dishes (e.g., chicken, parsnip, carrot casserole and the tasty beef recipe) I just get to skip the puree step (even my husband enjoys some of the recipes too!). Do you really have two hours available to cook your baby's dinner?! While the recipes for the youngest babies are fine (well, it's not exactly hard to puree a couple of pears! ), as the book goes on its recipes become ever more sophisticated and time-consuming. There are meals in here that require more ingredients and preparation time than I would invest in an adult dinner party! And at least your dinner party guests will actually appreciate your offerings instead of point blank refusing to touch them, as has happened on more than one occasion when I've ill-advisedly summoned the effort and time commitment to slog away at one of Ms. Karmel's gourmet creations. So far, a great reference and healthy guide. First of all, I bought the book Superfoods as well ( that one has the same basic recipes, but with gorgeous illustrations) and my review for that book will be the same. The plus side to both books is that Annabel Karmel is very creative. I mean very. She makes food so presentable to children ( esp toddlers)and very fun to make ( if you have the time). She even gives some accurate nutritional info about the importance of garlic, ginger, and other herbs/spices in a person's diet ( however, she fails to mention that some children have stomach problems after ingesting garlic). Where she goes WAY off is with her general nutritional information. For example, she recommends microwaving foods ad says it is not harmful. FALSE It depletes anything that it cooks of all nutrients. She goes on to mention the importance of including beef, pork, and poultry in a infants diet. In the China Study, which is the most comprehensive study ever done on nutrition in both America and abroad, it was discovered over 27 years of research that all meat ( excluding fish) and dairy are the main ( yes MAIN) contributers to cancer and a host of other problems that are affecting society. On top of that, most meat ( even if it says 'free range') has horrific hormones added to it, and the cattle/pigs/poultry eat poor quality, genetically modified ( on cheap farms) grass and corn. As far as providing adequate protein, calcium, and iron for our little ones, there are plenty of fortified cereals for infants, and veggies such as broccoli have lots of absorbable protein and calcium ( and spinach is a great source of iron). Even if you could care less about the impact that our consumption of meat and animal biproducts has on the environment, think about your child eating meat that came from an unhealthy, abused and hormone laden animal that has been eating ground animal waste ( no joke). It is not a pretty or healthy picture. Please do your research before giving your children meat and dairy, and be sure to find out if your child has any allergies to soy or wheat. I bought this product after reading the reviews regarding how complicated the recipes were thinking that how much time and effort could baby food recipes take. After reading through the book, you realize that in order to make many of the receipes you need lots of spare time to food shop, prepare and cook. All unrealistic given the time constraints of caring for a 12 month old and working part-time. Also, the recipes call for taking time to make food look "cute" and eye-catching, even recipes for older babies and young toddlers. Children that young don't care that the veggies are shaped like animals, flowers, etc. The presentation called for in the recipes is over the top. Lastly, some of the recipes call for foods and spices that I wouldn't think to give a young toddler. This book is for people who love to cook and have lots of time on their hands to do it. The book was not for me, too much work and not enough payoff. I found a few good idea's and yes, a few good recipes but beware before you buy it, it is not for beginners. I got this book prior to our son being born with the hope that I would be making all his food. I've now been doing so using this book and her Top 100 Purees for the last 5 months. I primarily use this book since we got past the most basic purees. I have made more than half of the recipes up through the 9-12 month section and every one of them has turned out great. There has only been one beef recipe that our son doesn't seem to care much for. I have to say too that I have tasted every recipe I've made and they are all delicious. I don't see how you could go wrong with it. I usually make a double or triple batch of each and freeze portions because the servings are typically small but when you buy the ingredients you usually have much more than they call for. I had this book on my wish list when my daughter was born and was thrilled to get one as a gift. As a first time parent, I had no clue what I was doing and was exceptionally paranoid about knowing what was OK to feed my baby and when. This book alleviated a great deal of uncertainty for me. My baby SCREAMED for more of this recipe! This book is very well organized and written. There's so much more than baby & kid appropriate recipes. The author literally teaches you what foods to feed children at which stages. This is my 3rd baby and I wish I had had the book for the other 2. On our first recipe, my baby literally screamed for more and then clapped because he liked it so much! We couldn't get it in fast enough. Portions were for a 9 - 12 month baby so I easily tripled and fed all 3 kids. I have only used it from 9 months on so I have not tried to make the smaller baby appropriate food. From 9 months on, the recipes were not difficult. I felt good about what I fed my kids and it was pretty easy! WONDERFUL: If you are nutrition-conscious and like to cook! This book isn't for everyone, but is WONDERFUL for our little girl and our family. My husband and I are determined to raise our daughter eating a WIDE variety of healthy foods... not a picky eater like so many children today. The recipes are fairly simple. She does have some foods common to England, but I found making substitutions to be easy. The foods/recipes are nutritious and yet appealing to our daughter. She has loved each of the recipes thus far, with the exception of one... this had fish and this was her first time to try fish. Nevertheless, we will keep trying and I believe she will be liking this dish soon as well. Terrible baby cook book for busy moms! * Faces and feet added to multiple dishes using fresh vegetables, etc. * Toothpicks added to Jell-O Boats with triangular wax paper (what mom gives their toddlers toothpicks?). Text says put on child's plate, then remove the toothpick sail. Please, what a waste of time and kids do not like things given and then taken away immediately. This author, who appears to have written quite a few books, doesn't seem to know pediatric standards on when to introduce certain foods to babies. Many of the dishes for under 12 months include cow's milk, citrus, strawberries, orange juice, etc, that are known to cause terrible allergic reactions in kids and can cause a lifetime allergic condition if introduced too early. * Pediatricians advise no cow's milk until 12 months of age, but many recipes are in the book calling for cups of cow's milk such as in the Creamy Chicken & Broccoli dish for ages 9-12 months, Flaked Cod with Tomatoes & Zucchini, Filet of Fish Mornay with vegetables, as well as numerous other dishes before age of 12 months. The book even tells you to give cow's milk at 6 months in the recipe Flounder in Leek & Cheese sauce. Also Flounder is known to often have small bones. I would not give my 6 month old such a dish! * Raspberries and strawberries are recommended in this book before age 12 months as well, which are foods NOT recommended by Pediatricians until over a year of age. They are known to often cause severe allergies and rashes. * Raisins for a 9 month old? - potential choking hazard recommended in the Fruity Baby Muesli. Not a good idea. My kids, at 9 months of age, would have gagged on this dish for sure. * Tablespoons of whole butter (with no suggestion of perhaps a butter substitute) in just about every other dish. * Lentils for a 6 month old in the Lentil & Vegetable puree recipe? Babies have enough digestion problems, then give them these kind of beans too? * Strawberries for a 6 month old in Peach, Apple and Strawberry Puree? Pediatricians say wait until 12 months, or even 18 months before offering a baby strawberries, blackberries or raspberries or citrus of any kind (oranges, grapefruits, etc). * Egg yokes are featured on page 53, Ages 9-12 months, and our pediatrician said no to egg yokes or egg whites until at least 1 year of age. This book isn't all bad. If you have abundant time away from your infant/toddler, or if your infant sleeps a lot, then many of the recipes are ok, but babies/toddlers probably will reject many of them, like the busy dishes with too many ingredients mixed together in sauces. Also, my kids liked being introduced foods separately that are finger friendly (not sticky), so they can recognize and even talk about them. From my experience, an 18 month old does not like plates of numerous mixed-up foods like the Sweet & Sour Vegetable Stir Fry. I sometimes mix up to 3 items in a dish, but no more (like chicken, broccoli & carrots over a bed of rice). Personally, I didn't find this book helpful at all as a mom with an infant and a toddler, although a lot of effort went into it. The author should have worked with pediatric standards and experienced moms, and perhaps the results would have been more helpful. I do like the Egg-Fried Rice dish, although the shrimp made my 3 year old throw up (think allergic). I learned from our part-time nanny, who is married to a chef, that it's faster and easier to make fried rice by browning uncooked rice in a pan, then add the onions, thin pieces of sliced ham, carrots, etc, then add water, then simmer (cook scrambled egg in separate pan). Our kids love our nanny's recipe for fried rice and much faster. Also, the layout of the book is also confusing with essential information hidden in a preface or random spots, recipes overlapping or running onto another page, and pictures scattered about. I like recipe books that dedicate a 2-page spread to a single recipe (with no overlap), and include a section at the top that lists the ingredients, then the total prep & cook time, suggestions for what to prepare in advance to accompany the dish, and lastly suggestions for substitutions. This book is laid out more like an editorial magazine for someone to sit and read while on the sofa or while getting a pedicure, and not for a busy mom or dad who needs to run into the kitchen and make something fast and healthy for their child. In summary, this baby/toddler recipe book is for a mom who has the luxury of telling her professional chef on staff which recipes to make without concern for allergies, choking hazards, or what children actually like to eat.